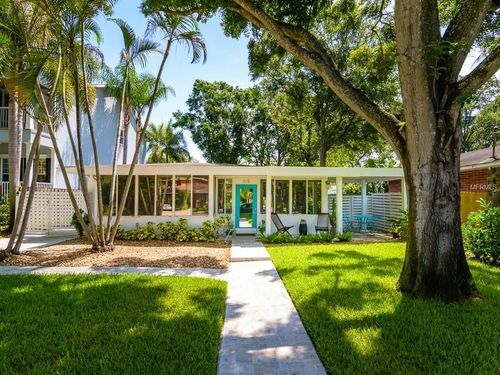 Exciting Davis Islands mid-century gem offering the finest in modern comfort. 3 BR / 2 BA with an open floor plan that is superbly styled going from âMID to Millennialâ. You will be saying WOW from the moment you walk through the front door into the light and airy living room featuring mellow-tone new wood floors throughout. The kitchen is sure to please with gleaming stainless-steel appliances, sleek cook top, and wine refrigerator. A stunning backsplash accentuates the clean lines and carries your eye to the dining area. From here the adjoining family room overlooks the backyard and patio. A perfect spot for entertaining. Tropical plants and well-manicured landscaping make this home a complete surprise package. Conveniently located to Island shops & restaurants. Enjoy bike rides to neighborhood parks, nearby Bayshore & Riverwalk. A MUST SEE.